There is a book available on the miracles as well as links to the .pdf files that make up the posters of the exhibition. These miracles are truly amazing and will help enhance your faith in the Real Presence of Jesus in the Eucharist. 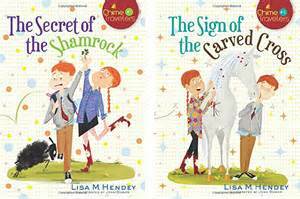 Lisa Hendey of CatholicMom.com fame has written two new books for children, the start of the Chime Travelers Series. Published by Servant Books (Franciscan Media), they are aimed at children age 7 - 12. If you don't have any children in that age range, you might want to consider buying a copy for your parish library, or local Catholic elementary school. When the bells chime, get ready for fun and adventure as you join Katie and Patrick on their travels back in time to far-distant lands. The mysterious strangers they meet along the way turn out to be saints of old who become close friends and help our young travelers understand their faith a little better. Are you ready for the trip of a lifetime? Be ready when you hear the bells chime. I read these books this weekend and both were delightful - teaching the faith by reaching kids where they are on their faith journey, maintaining a sense of humor, and providing an introduction to the lives of saints. Each book also includes a short biography about the featured saint and discussion questions. When Patrick's mom volunteers him for the cleaning crew at his local Church, he is less than thrilled. He'd much rather be hanging out with his friends or playing with his frog, Francis. But when the bells chime and he ends up in ancient Ireland, he has to trust a shepherd to help him to find his way home. This story teaches lessons on kindness and the value of prayer, trust in God, and the sacrament of confession, as well as introduces children to the life of St. Patrick. Katie is feeling jealous and insecure and so she joins her friends in being mean to the new girl, Lily. But then she finds herself back in 1675 in a Native American village,. Now Katie is the new girl, but Tekakwitha, a young woman with horrible scars on her face, is kind to her and keeps her safe. Tekakwitha is treated poorly by her family due to her Christian faith and she and Katie are forced to run away in the middle of the night. This story examines how hard female relationships can be for young girls and the importance of being a friend. It also teaches the value of Baptism and 1st Communion as well as introduces children to St. Kateri Tekakwitha. 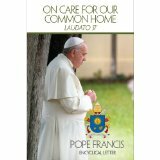 Laudato Si, The Pope's Encyclical Letter "On Care for our Common Home" is now available in paperback. I just received my copy this week and it is truly worth reading. Don't just get the soundbites from the media - actually read and reflect on what the Pope is trying to tell us. Whether you believe that the earth is warming or not or that human activity has contributed to it or not, taking care of the earth and each other is what we are called to do as Christians. I guarantee that you will find something in this letter worth thinking about, and maybe even be moved to make some lifestyle changes as a result. If you are looking for a guide to your reading, CatholicMom.com is currently running a series of reflections (I'm working on writing the reflection for Chapter 6 right now). Can God speak through a child? What about a child who has never been taught anything about Him? Leah Norcross is a young girl with a stutter. She and her parents have just moved to the small town of Mattingly from Away and are considered outsiders by almost everyone. "When Mockingbirds Sing" is a well-crafted thought-provoking novel that will keep you turning pages. What will happen to Leah and the people of Mattingly? Where does a child's imagination end and reality begin? What will a parent do for a child? I am a huge fan of "The Christmas Tree" by Julie Salamon and the movie by the same name which starred Andrew McCarthy and Julie Harris. McCarthy is a landscape architect who works for Rockefeller Center and Harris plays Sr. Anthony who owns the tree that McCarthy wants to use for the famous Christmas tree that becomes a symbol of New York each year. The two form an unlikely friendship, each teaching the other some valuable lessons. 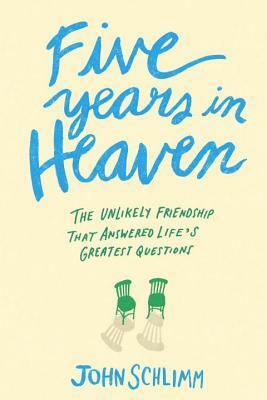 The parallels between that story and "Five Years in Heaven" by John Schlimm are many. Schlimm was 31 years old, had worked in public relations for Tipper Gore when she was Second Lady as well as for Nashville star Naomi Judd. He had gone back to school graduating from Harvard in order to become an English teacher, but had found himself unemployed, living back in his hometown, and working as a sub at his high school alma mater. Rather disappointed at his place in life, his friend brought him to meet Sr. Augustine, the nearly 90 year old sister who worked at the local Benedictine convent's ceramic shop. Sr. Augustine and Schlimm would develop a close friendship over the next five years. Sr. Augustine would teach Schlimm much about life. Schlimm in turn would help promote her ceramic work, finding new customers and even having her interviewed by the local media. This book is worth reading because of the lessons Sr. Augustine, who has since gone on to her eternal reward, has to offer, which Schlimm has lovingly shared with the world. This story also inspired #thankanun day which was held on May 5th to coincide with the book's publication date. Here is one of my favorite quotes by Sr. Augustine: "What happens in that kiln is out of control once I shut the lid. Just like the things that happen in life. We have no control over the joys and sorrows that come to us. . . .Yet each joy and sorrow is a gift. . . . We can choose whether to let that sorrow destroy us or make us stronger, better people." 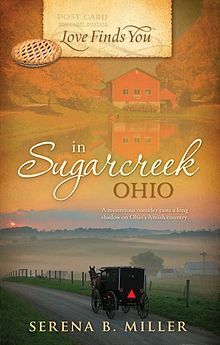 This book is a few years old, and was even made into a movie so I am coming late to the party, but "Love Finds You in Sugarcreek, Ohio" by Serena Miller was an enjoyable Amish mystery/romance based on the passage from Hebrews: "Be not forgetful to entertain strangers; for thereby some have entertained angels unawares." Policewoman Rachel Troyer has just about convinced her elderly Amish aunts to close up the inn that they have run for years. She fears it is too much for them and she has the money to support them. They reluctantly agree, but tell her that if they feel God has sent someone, they will not turn him or her away. Rachel reluctantly agrees, but doesn't expect them to take in a down-on-his-luck man from out of town with no ID who has a young son and is clearly on the run. All of her police training goes into high alert. Convinced that he is up to no good, she is determined to find out who he is and what threat he poses to her family. This story has some surprising twists and turns which will keep you turning pages. It also has a middle-aged woman with Down Syndrome playing a supporting, but important role. 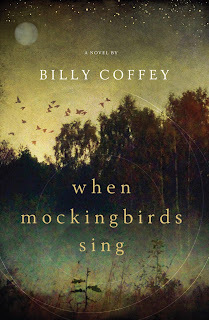 Overall, it was a very enjoyable story which fans of Amish fiction will relish. 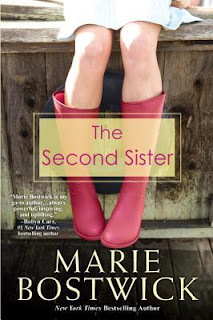 I recently read and reviewed the Cobbled Court Quilts Series by Marie Bostwick and was thrilled to discover that she recently published a new book, "The Second Sister." Lucy Toomey is a workaholic political campaigner whose hard work has just paid off - her boss is about to enter the White House, which means that Lucy has a job waiting for her on Pennsylvania Avenue. But when her disabled sister Alice dies unexpectedly, she is forced to return home to small-town Wisconsin in order to settle the estate and meet the eccentric terms of Alice's will. There she will be forced to face some of her old demons as well as learn about a sister she only thought she knew. She'll learn some important things about herself as well. This book invites readers to think about their priorities and the role of siblings in our lives. Fans of quilting novels will be happy to know that quilting plays a prominent part in this story as well. Bostwick wrote this as a stand-alone, but admits she might be open to starting a new series focusing on the individuals in this book. If she does, I'll be happy to read it. I gave it to my sister for her 50th birthday! Lisa Duffy, an author and speaker for the CatholicMatch institute, overcame a painful divorce and annulment, remarried in the Church, and has spent the past twenty years ministering to those who have been wounded by divorce. 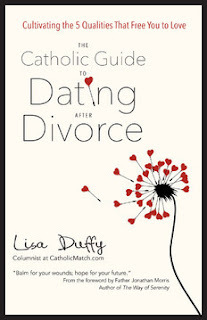 In "The Catholic Guide to Dating after Divorce," Duffy provides authentic Church teaching on divorce, annulment (including the benefits of going through the process), remarriage and receiving the Eucharist. Sharing her first-hand experience, she understands the pain of going through a divorce. "Rebuilding after divorce is hard work and it requires patience and persistence . . . It is easy to lose sight of the fact that we are lovable, valuable, and God still has great plans for us." Soon after her divorce, co-workers and other well-meaning individuals wanted to fix her up on dates, but Duffy cautions that one must "take the time to properly heal from your own divorce before entering into a serious dating relationship." How does one do that? Duffy offers five attraction factors that help an individual become a better version of themselves. These "five factors will help you become the best, most attractive version of yourself, and pave the way for you to experience greater satisfaction in your relationship, and to improve your ability to give and receive love." These five factors include being available, being affectionate, being a communicator, being faithful, and being magnanimous. Duffy has extremely high standards for individuals to meet before being ready to date after a divorce (or to date in the first place). If everyone met them, no doubt the world would have many more happy marriages. However, we live in a world of imperfection. Perhaps it would be more practical to aim for the high standard, but be willing to accept an 80% success rate in both oneself and potential partners. Duffy offers concrete advice and areas for individuals to work on to heal from divorce and prepare for dating. "The Catholic Guide to Dating After Divorce" is a book many divorced Catholics can benefit from. It also might make for good reading for parish priests and pastoral ministers to help in their role as counselors to the faithful. I recently picked up the Sept.-Oct. 2014 issue of Home Education Magazine. In it, Kate Fridkis writes about giving up her full-time career to take on part-time work and be a stay-at-home mom to her young daughter. She struggled with the type of role-model she would be to her daughter and how this decision related to her being a feminist. Being available to your child is a big, radical deal, especially in a time when people dismiss its importance. It requires huge bravery and enormous dedication and oceans of patience and a galloping sense of humor . . . it's up to me, in the end, as it's always up to each of us to take charge of the conversation and educate my career-oriented friends about my choices and what they really look like. . . .Instead of saying, 'I have to keep up my career, if only for my daughter's sake,' I'm experimenting with saying, 'I have to be proud of my choices, if only for my daughter's sake.' Because that is how you model feminism. That is how it works. When I was young, I dreamed of having a little girl. I wanted someone to like the same stories I had enjoyed growing up and to share my love of dolls. These were silly reasons, of course, but I simply couldn't imagine life with sons. What would I possibly do with them? What would we have in common? Then, of course, God gave me two sons, and I loved them with all of my heart, and they've broadened my horizons as I have broadened theirs. And as time went on, I was thankful that I had boys and not a girl because I could encourage them to be whatever they wanted. They would never have to struggle, as I did, with the pain of giving up a career for motherhood. I have always tried to stay out of the mommy wars. I firmly believe every mother does the best she can and that God calls us to different lives, that these paths are revealed through prayer and our individual circumstances. God called me to be a stay-at-home mom, and then a homeschooling mom, and I try every day to be the best mom I can be. Mind you, some days are definitely better than others. Thanks to the internet, I've had the opportunity to work part-time for which I am incredibly thankful. Yet, there are still days, especially ones in which no paid work is to be found, that being a stay at home mom hurts. Even though I can't imagine turning over the primary care of my children to someone else and am extremely thankful that I am able to be with them, it is hard to sacrifice my dreams, intellect, and gifts for my children. It is a sacrifice God has asked me to make. Fourteen years into the process, I'm still working on gracefully making that sacrifice, on using my gifts the way He sees fit, in the opportunities that He gives me. No doubt many mothers who work outside the home struggle with sacrificing spending time with their children. No matter what anyone might say, mothers cannot have it all. In the years in which we are raising our children, something always has to give. And then, a little over four years ago, God gave me a little girl, and I wondered how I would ever be a good mother to her. How could I be a good role model? What would she learn from me about how to be a woman? Could I encourage her to pursue her dreams, knowing in the end, if God calls her to motherhood, she might have to give them up? I truly struggled with this, but then, in time, I realized that deep down, I wanted the same thing for my little girl that I wanted for my sons - I want them all to be the people God made them to be. I pray for that every day. I don't know what the future holds for any of them, but I can encourage all of them to pray and discern and explore. I can do the best I can with this day to give them the best lives I can provide. I can trust that God has a plan for them and that His plan is infinitely better than my plan. I can trust that if they live the lives God calls them to, they will be successful in the only eyes that truly matter. Colette Lafia, spiritual director, writer, retreat facilitator and part-time school librarian, knows something about having dreams not come true. She and her husband are infertile and all their prayers and efforts to conceive a child came to naught. In addition, her sister died of breast cancer, her husband's business failed, and she suffered from chronic insomnia. Such was Lafia's life in October 2002 when she traveled to the Abbey of Gethsemani in Kentucky searching for some peace. There she would meet Brother Rene, "an elderly monk with a warm and down-to-earth disposition . . .[who] would become [her] spiritual companion, teacher, and a source of inspiration for seven years." The two bonded quickly and begin an epistolary relationship in which Brother Rene would help Lafia to learn the value of surrender. "Surrender is the spiritual aspect of acceptance, inviting and allowing us to hold our experiences and lives with grace in every moment." When we have embraced surrender, "we stop wanting our lives to be something other than what they are and begin to recognize what is right in front of us, the life that is truly our own." It was an important lesson that Lafia would need even more as she cared for her father who was dying of Parkinson's disease. He, too, had to accept the gift of surrender as he needed to release control and let others care for him. Lafia writes in beautiful and honest prose, sharing her weakness and struggle as she comes to terms with the life that she lives and the new opportunities that God provides. An attitude of surrender can be beneficial at any age, but is perhaps most suited to those who have experienced some great loss in life, be it of family members or a long hoped for dream. After life has dealt some fierce, painful blows, one must dig deep for the ability to go on. 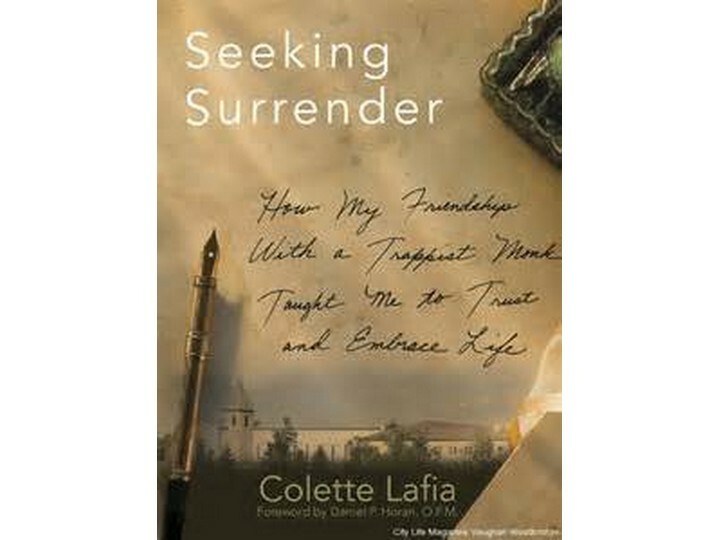 A spirit of surrender can only serve to help that process, and "Seeking Surrender" offers a gentle roadmap to letting go. It is evident from the very first pages of "Arriving at Amen" that Leah Libresco is a highly intelligent woman. A former atheist, she came to believe in God through a logical process, a proof by contradiction. 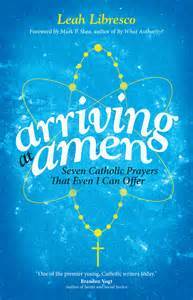 She describes seven types of prayer: petition, confession, the examen, the rosary, the divine office, lectio divina, and the Mass, and shares how she came to understand and utilize these forms of prayer in her own life. Unlike many of us who have embraced the Catholic faith since birth, Libresco has a constant spirit of questioning. She comes to these prayers from a radically different perspective. As an example, she attempts to explain transubstantiation via algebraic formulas. While such an explanation was beyond the intellectual capabilities of this reader, one has to give Libresco credit for originality and a fresh look at traditional prayers and rituals. Libresco holds St. Peter in high esteem, describing him as having "a loud faith" - always bold, always questioning, always trusting in God, and always moving forward. It is this faith that she wishes to emulate and she invites her readers to go along for the journey.